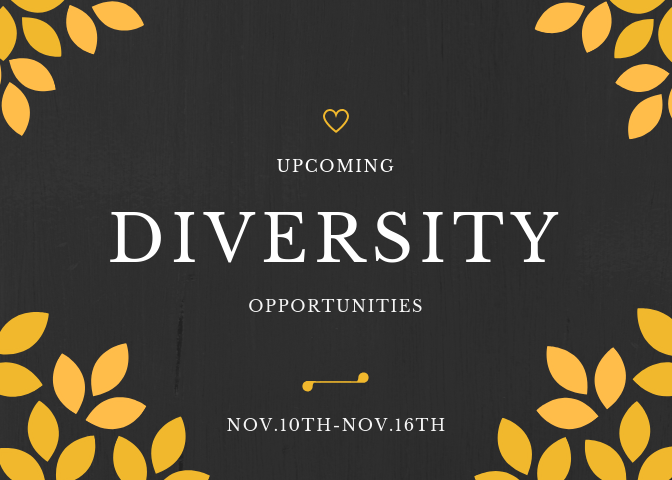 The Diversity and Inclusion Committee will send out upcoming opportunities every week we think will be of interest. We hope that you will help us continue to build a library culture of diversity and inclusion. At the end of each month, we will have an open forum for those who are interested in debriefing about the workshops/sessions/trainings you attended. Saturday, Nov. 10th, Missouri Theatre. The University of Missouri (MU) Asian Affairs Center and the Choral Arts Alliance of Missouri (CAAM) are organizing “Sounds of Japan” at the Missouri Theatre at 7:00 p.m. on Saturday, November 10, 2018. CAAM will be performing with the iconic St. Louis Osuwa Taiko drummers for our Sounds of Japan concert! Partnering to celebrate the Asian Affairs Center’s 20th anniversary and CAAM’s 40th anniversary, the music will take the audience on an aural journey to Japan! General Admission $20 at the door or Buy Online for Advanced Ticket Pricing 15.00; $5 students with ID. You can buy tickets here. Come hear Jemele Hill, staff writer for the Atlantic and former ESPN correspondent and columnist, speak. Nov. 13, 5–7 p.m. Student Leadership Auditorium, Student Center. A viewing of “From the Land of Ghandi,” a film on U.S. high-skilled immigration. Stay after the film for discussion. Sponsored by the MU International Center, Gradaute Professional Council and the Post-Doctoral Fellow Association. The views, thoughts and opinions expressed in the film belong solely to those featured in the film and are not necessarily those of the MU International Center or the University of Missouri. Join IDE’S Office of Inclusive Engagement for our Core Concept Series in collaboration with the College of Education. Diversity and inclusion are labels used to express complex, multi-faceted organizational strategies, goals and values. The purpose of the Core Concepts Series is to provide members of the Mizzou community with a foundational understanding of essential ideas to promote diversity and inclusion at Mizzou. To register, you can email Alejandra Gudiño . Discover Islam is a lecture series organized by the Islamic Center of Central Missouri. The series offers the opportunity to learn about Islam from local community members. Sponsored by the MU International Center.